How do you get perfect wave selection? Is perfection even possible? Maybe. Waves are a funny thing, every wave is different, but they can look quite similar. Predicting how a wave will break may seem like a difficult task, but don’t worry. There are a few things you can do to get yourself prepared, and we’ve got four great tips right here to improve your wave selection. In order to get perfect wave selection, you need to know your surf break in and out… or at least know what makes your spot tick. Several factors go in to creating a surfable wave at your break. It usually starts by a storm far out at sea. Powerful winds wash over the ocean, creating friction in the surface of the water. Over time, this friction builds up more and more, to create powerful swell that can travel over entire oceans. Once the waves reach shallower water, your surf break for example, they jack up in size and fold over themselves. This is what we call breaking waves, or “surfable waves”. To have those perfect, glassy waves of your dreams, a number of factors must come together. If the wave period is too short, with howling onshore winds, in an extreme high tide, chances are that the waves won’t be very good. With terrible conditions, chances are most of the surfed waves will be pretty terrible too. Longer wave periods, over 10 seconds. Surfing in great conditions will make it way easier to select your perfect wave… … but as you already know, perfect conditions aren’t always there. That’s why we strongly recommend you to surf in lesser-than-perfect conditions as well. If you can develop perfect wave selection in subpar conditions, chances are you will absolutely excel on those good days. Just don’t go out in hurricanes or anything too crazy. Research your surf break online. See what weather conditions and type of swell makes your surf break go nuts. Read up on the best tide, wind direction, swell direction and type of swell. Then go surf as much as you can on those good days. Watching the waves is a big one and goes hand in hand with our first tip. You first need to know about the perfect conditions for your surf break, to know when it’s go time. Then, you need to spend some time watching the waves when you get there. It doesn’t have to be an hour long watching session… but in order to build up your perfect wave selection, you need to see how the ocean behaves before you paddle in. This could be done when doing your warm-up stretches, or when debating where to paddle out with your friend. When watching the waves, there are a few things you should look for. “The peak” of a wave, means the position where the wave will start breaking first. Or, the ideal place to paddle and surf the wave. You should always try to catch the wave right at the peak, to gain maximum speed and momentum. Shoulder hopping doesn’t do you any favors (on super crowded days we’ve all been there though…) and will limit your progress. Look for where the line-up is and see where the other surfers are. Hopefully, most or at least a few surfers will know where the best place to sit is. In order to perfect your wave selection ability, you need to watch how the waves are breaking. Are they mainly lefthanders? Righthanders? Is it a slower, mushier wave, or a fast, steaming, barreling freigh train? See if you can spot different sections in the wave. How many waves are in each set? Which wave is the biggest, and how far apart are the sets? Having crystal clear knowledge about the waves you’re going to surf is critical for perfect wave selection. If you don’t know which waves you want to surf, how could you see them in the line-up? It makes a lot of sense to know what you’re getting yourself in to before paddling out, which is why this is so important. -And which waves you don’t. While in the water, having the ability to read waves is essential for perfect wave selection. coming at you fast. Almost in an instant, you have to make the decision of whether to go, or to bail. How do you even know if it’s a good wave? Are you in a section that will just close out or are you in perfect position? There is quite a simple technique you can use to read how a wave is going to act. First off, use the horizon as a reference. Compare the angles of the incoming wave to the vertical line. The picture beside shows what an incoming wave could look like. You could be closer to the right or left side, or you could be right in the center. What does this mean? When should you paddle? Looking at the wave coming at you, the left side is called a “right” because you go right when you surf it. The right side is called a “left” because you surf it to the left. On the left and right side, you see the ends of the wave. This is called the shoulders of the wave. Shoulder hopping means catching the waves far out on the shoulders and should be avoided. The shoulders lack the power and speed that the peak provides. Beware of closeouts (a wave “shutting down”). On an incoming wave, it’s quite easy to tell whether it’s a closeout or not. Any part of a wave that’s parallel to the horizon (vertical) will break first. Only the angled parts of a wave will break slower. In the example below, pretty much the whole middle part of the wave would break at once. Is it a slow or fast breaking section? The more vertical the wave is, the faster it will break. A steeper angle will break slower. In the example below, the right hander on this wave would break faster than the left hander. Why is it like this? Physics. And gravity-stuff… I don’t know. Which direction do you surf? If the wave looks exactly like in the picture, with both the option of going left and right, you have to make out which side you are closest too. 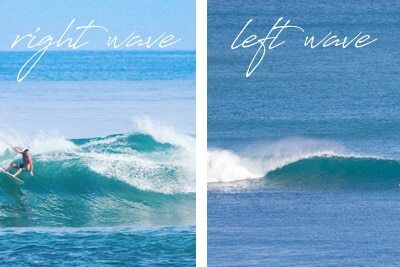 If you are closer to the right, you catch and surf the right hander. Closer to the left? Then you surf the left hander. To get the most out of each wave, it’s important to adapt your surfing to the waves you surf. You now know which conditions make your surf break great. You have watched the waves. With the surfboard around your arm, you sprint down to the beach, adrenaline rushing through your system. Reading waves is now a piece of cake. 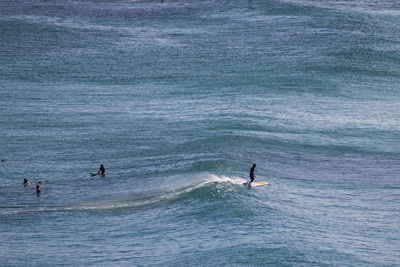 You now know whether it’s a right or left hander and have some ideas on how to surf it. You also know where the peak is located and have decided on your focused location in the line-up. If it’s a smaller day and a bit onshore, with fast sections, try working on your airs. Maybe work on your bottom turns or quick snaps. If it’s barreling but closing out, work on getting tucked in the barrel. Practice steep, fast drops. Work on getting pounded. Make it clear in your mind before you jump in, what kind of surfing you are going to do with the waves of the day. This way you take full advantage. The key to selecting the perfect wave is to know which wave you want. And paddle for it. In need of good waves?